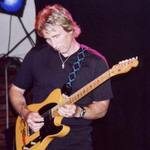 I've created an iMix in iTunes called Jazz Rock Fusion Guitar. It's a collection of some of my favorite fusion and instrumental guitar music that is available on the iTunes Music Store. Some of the songs may be familiar to you, but there's some cool obscure stuff in there as well. Clicking the link below will bring you right to the iMix in iTunes. Check it out! Paul Gilbert's Get Out Of My Yard Guitar Instructional DVD has already been released in Japan, and will be out in Europe (and I believe the US) this coming April. The DVD is essentially a companion piece to Gilbert's Get Out Of My Yard CD. Most of the DVD is instructional, but there's a live Racer X solo, and some songs from a live Musician's Institute performance included at the end as well. 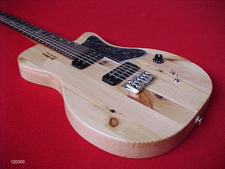 For the instructional chapters, Gilbert uses a wide variety of guitars to demonstrate how he plays each song from Get Out Of My Yard. For some songs, such as "The Curse Of Castle Dragon" and "Rusty Old Boat", he give lots of specifics regarding the scales and chords used. For others, such as "Full Tank", he talks more about what inspired the tune than how he actually plays it. I prefer the more detailed chapters, but they're all very cool nonetheless. After each Get Out Of My Yard song is shown, there are 4 Appendix chapters where Gilbert discusses Hammer-On's & Pull-Off's, Arpeggio's, Vibrato, and Alternate Picking. He doesn't show a lot of patterns or licks in these sections. It's more of an overview of his personal approach in each of these areas, and how you can improve in these areas yourself. For the picking chapter, for example, Gilbert discusses actual picking mechanics (how he holds his wrist, the angle of the pick), instead of showing a bunch of licks. Maybe since he's already shown lots of patterns in his other instructional video's, he wanted to take a different route here. This might be frustrating for hard-core guitar players, but I can see how this would make the disc more accessible to all guitar-playing Paul Gilbert fans, whether they are long-time players, or they are just starting out. In between each chapter, there is a short snippet from the same MI show that the songs at the end on the DVD were pulled from. This is some of the best stuff on the disc. I'd love to see this entire show released someday. One thing I found odd is there is no notation of any kind included for the instructional portions of the DVD. Gilbert basically just shows you what he's doing. The camera work is great, and Gilbert does demonstrate the faster parts slowly for the viewer, but I think this is the first "instructional" video I've ever seen that doesn't have either on-screen tab, or a tab/notation booklet of some kind. In addition to the instructional chapters, there is a live solo from the Racer X Superheroes Japan Tour, and 4 live songs from a concert at MI in Hollywood. The Racer X solo is cool, but the camera is to Gilbert's right so you don't get a good look at what he's doing. The MI songs, however, are really great. Gilbert's band is just a three-piece for this show; no rhythm guitar or keys. They sound really tight as a power-trio. "Rusty Old Boat" is particularly good. 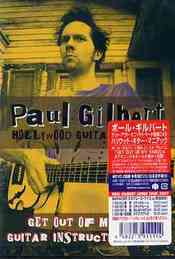 The Japanese version of this release includes a bonus DVD of Gilbert performing alone over backing tracks at the Hard Rock Cafe in Tokyo in 2006. 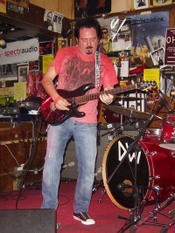 He plays songs from Get Out Of My Yard, plus 2 Racer X instrumentals and "Mt Fuji Xmas". This is a beautiful looking video. It's presented in 16:9 and looks gorgeous on an HDTV. The setting is very small and intimate; Gilbert's playing on a tiny stage in front of a very small crowd. Overall, it's pretty cool, but I have a couple of bones to pick with this show. For the first half of the concert, Gilbert doesn't use his mic when he's talking in between songs. He just yells to the crowd and you can't hear a word he's saying. This made me want to pull my hair out, which I can ill afford to do. Also, his guitar tone is pretty fuzzy throughout. It's plenty loud (maybe too loud), but the tone itself too scratchy. Gilbert has a few hiccups along the way, but there's some great moments here (seeing Gilbert get through "Haydn's Symphony No.88 Finale" unscathed, alone on this tiny stage in a little bar is pretty impressive). It's a cool show, but I'd rather have had the entire MI concert instead. Overall, this DVD is a must-have for Paul Gilbert fans. Personally, I don't think of it as an "instructional" video in the traditional sense; it's more like an inside look at the Get Out Of My Yard songs. If you're a hard-core fan, I would say go ahead and get the Japanese version for the Hard Rock Cafe show. You can purchase the Japanese version (with the bonus DVD) from CDJapan. The single disc version will be available from Mascot Records in April. 13.Haydn Symphony No. 88 : Crank Up the Bassoons! Steve Lukather is interviewed on the 2/23/07 episode of the Inside Musicast podcast. He discusses the new solo album he's currently working on, the upcoming European tour with Toto, and more. Steve Weingart, Frank Gambale, Tom Brechtlein & Carlitos Del Puerto are proud to announce "Nu Jazz Alliance" which previously performed under the name "the Steve Weingart Band" at recent shows in the LA area. A European tour is planned for September 2007, together with a Nu Jazz Alliance CD release later this year. Check out www.myspace.com/nujazzalliance for the latest news. Brett Garsed has posted a cool live version of "Fu'd Fight" on his MySpace page. T.J. Helmerich has posted the following update on his website and MySpace blog - The next Uncle Moe's Space Ranch album will be released in May. This is the follow-up to the excellent Uncle Moe's Space Ranch album from 2001. The new album is titled Uncle Moe's Space Ranch - Moe's Town, and features T.J. Helmerich and Brett Garsed on guitars. I'm pretty sure the rest of the lineup is the same as it was for the first album, which would be Gary Willis on bass, Dennis Chambers on drums, and Scott Kinsey on keys. Steve Lukather's site has a review by Reggie Boyle of the Feb 9th "Super Live" reunion show with Greg Mathieson at the Baked Potato. Some cool pics are included as well. Alex Machacek has updated his website with some pics from the recent Out Trio tour of Japan, and some interesting news. - Out Trio drummer and frequent Machacek collaborator Terry Bozzio has joined Korn (!). As a result, the planned 2007 European Out Trio tour has been cancelled, and the next Out Trio CD is on hold. - Alex contributes to an ambitious new project from drummer Marco Minnemann. Minnemann has recorded a 50min drum solo, and asked several other musicians to compose music around it. The project is called "Normalizer2", and also features guitarists Mike Keanelly and John Czajkowski. - Alex is also working on his next CD, which features the same "composing around drum solos" concept used in some of the pieces from his last album [SIC]. Drummers Bozzio, Minnemann, and Herb Pirker have contributed solos so far. Jeff Sipe, Chad Wackerman, and other should be involved as well. I love my Nintendo Wii. One of the coolest features is the Opera browser for web surfing. When I first heard it would have this functionality, I wondered if it would be able to do streaming music. I figured SHOUTcast streams wouldn't work, since they operate using a .pls file (You launch the file using your music player of choice, the player connects to the ip address in the .pls file, and the music streams from that ip to your player). The Wii handles most embedded flash players well, but since it has no separate music player to play a .pls file, I figured SHOUTcast streams wouldn't be possible. Then I heard about WiiHear.com. Wii Hear is a site where they use a flash-based player to launch SHOUTcast streams. They have about 80 stations listed so far, and they are adding more all the time. One of the recently adding stations is... you guessed it, The Guitar Channel! Now you can blast The Guitar Channel in your living room by streaming it through your Wii. It's super cool. Just go to WiiHear.com through the Wii's Opera browser, go to the Rock section in the directory (that was the closest category I could get), click The Guitar Channel, then click the big play button. If the stream is running and there are open slots available, the music will start playing. Enjoy! This should be pretty cool. Larry Carlton has a new live album coming out with special guest Robben Ford. It's a Japanese import; not sure if it will be released in the US. There's also a video online from this show, which is apparently from a forthcoming DVD.